Not familiar with Jack Nicklaus? Well, brush up on golf's greatest player because he was was coming to meet them. Nicklaus, who won 73 PGA Tour events including a record 18 major titles, stopped by Rogers Park Golf Course to dish out some pointers, answer questions and sign autographs. It was part of a day trip to the area for the Hall of Famer that included a stop at Tampa General Hospital's pediatric care unit and a fundraising dinner for the group at night. While at Rogers Park, Nicklaus evaluated some swings from the group, which was made up mostly of middle and high school students. 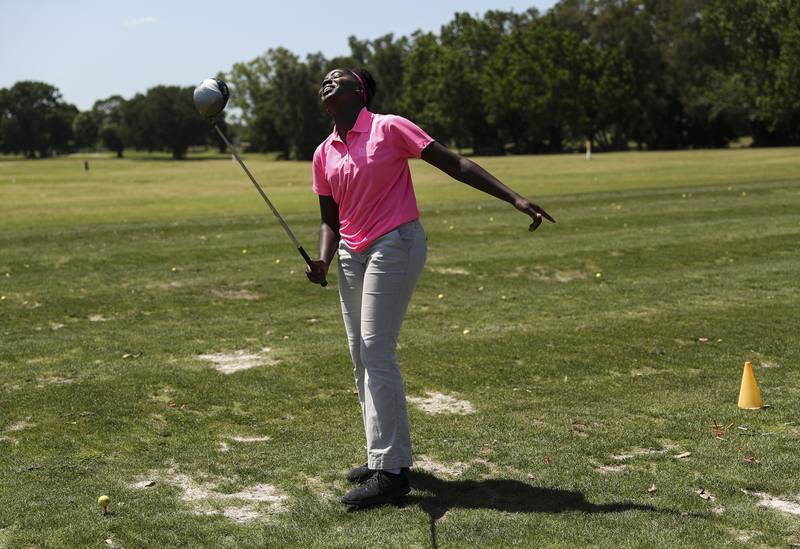 "It's super cool but it was really nerve-racking," said Lailah Carr, a 13-year-old First Tee member who attends Ferrell Middle School in Tampa. "I was about to cry a little bit because I had this terrible, terrible shot in front of him." Nicklaus, 78, fielded questions afterward on a myriad of subjects, including how he got started in golf (his dad picked up the game after breaking his ankle; he was told to find a sport where he could walk); his favorite golf course (Pebble Beach) and his favorite moment in golf (last week when his grandson, Gary, made a hole-in-one on the ninth hole of the Masters' Par-3 Contest; the "Golden Bear" also said the 1986 Masters win at age 46 was fairly memorable). "What was so unusual about (the hole-in-one) is that we talked about it on Sunday. Then on Tuesday night again and then he went out and actually did it (Wednesday)," Nicklaus said. Nicklaus, who lives in Jupiter, does not have a big history of playing in Tampa Bay. But one interesting note is that his second-to-last championship as a professional was the 1996 GTE Suncoast Classic in Tampa on the Champions Tour, when he was 56. Nicklaus is the grandfather of former Florida State tight end Nick O'Leary, a fact brought up on nearly every broadcast involving O'Leary's teams. Nicklaus was there when FSU beat Auburn in Pasadena, Calif., for the 2013 national championship, and he still travels to see O'Leary play for the Buffalo Bills. "Everything Nick did was special," said Nicklaus, who estimated he went to 12 or 13 Bills games last year. "He's getting better and better with the Bills. I think he would like to have (Bucs QB) Jameis (Winston) throwing it to him. We've talked about him coming down here and so has Jameis. But they've got some good tight ends here." At the end of the 90-minute event, First Tee members lined up to get an autograph and picture with Nicklaus. They only got to see him play on old YouTube videos, but they were impressed by their visitor. "It was amazing," said 14-year-old McKenzie Kane, a freshman at Steinbrenner High. "Getting to meet a legend like that is something you'll never forget." Nicklaus said getting to help a new generation of golfers is fulfilling. "It's all about teaching the lessons learned through golf," he said. "I saw a bunch of really good kids today. They all want to learn not just about golf but about life. That's what it's all about."